Poll – should the undocumented be allowed to vote in Santa Ana’s local elections? 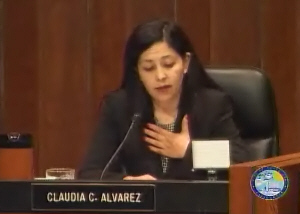 Santa Ana’s City Council members voted 5-0 Tuesday in favor of adopting a Sanctuary City resolution that requires the city to strengthen various policies that already exist to further protect undocumented residents, according to the O.C. Register. SANTA ANA, CA – October 31, 2014 – In order to allow greater flexibility in voting for the November 4, 2014 General Election the Orange County Registrar of Voters will be open Saturday, November 1, 2014 and Sunday, November 2, 2014. The Registrar will also accept voted vote-by-mail ballots for voters that wish to drop them off that day. The upcoming Statewide Direct Primary Election, Tuesday, June 3 and the General Municipal Election, Tuesday, November 4 provide an opportunity to review your voter registration requirements and upcoming dates. If you have moved since the last election, changed your name or political party affiliation, you will be required to re-register in order to be eligible to participate in the upcoming elections. If you are turning 18 on or before Election Day, you are eligible to vote. Please exercise your American right to vote today! There are people all over the world who cannot elect their political leaders. In some cases the elections in their countries are flat out rigged – and in others they are allowed to vote for one candidate. And some countries, like Cuba, simply don’t allow elections at all. But here in the United States we have the right to vote. It is dismaying that so many voters in this country simply choose not to vote. How silly. The O.C. Register, the Voice of OC and that annoying fake liberal blog all lost their minds wondering if it was legal for Santa Ana Mayor Pro Tem Claudia Alvarez to vote for an alternative motion that resulted in her censure, but avoided the far worse fate that Council Members David Benavides and Carlos Bustamante had in mind for her.